Your puppy not only depends on you for what’s in his bowl, but also for the quality of the ration that you put in the bowl. That’s a big responsibility. Owners need guidance to sort out the truth from the fiction and old wives tales. Additionally, with so many products on today’s market, is it any wonder that people are confused? The goal in correct puppy feeding is to provide the right food in the right amount so that your puppy will achieve the average growth for their breed. We don’t want him to grow too fast since this can produce health problems later on. Researchers have shown that overfeeding for maximal weight gain should definitely be avoided. In fact, slight underfeeding is preferable! A puppy food must be just that – a food for puppies. An adult diet is not suitable for growing active puppies. Cat food is not appropriate as dogs require different components in their diet from that of cats. Our hospital can advise you on the most appropriate food and feeding regime for your puppy. An important point – once you have decided on a partcular product feed it exclusively. Avoid supplementation with meat, table scraps, mineral and vitamin supplements etc. as this will often create a finicky eater, nutritional imbalances or both. Bones, fat trimmings and grease should not be given to your puppy as these can cause serious stomach and intestinal problems, including perforation and pancreatitis. Our hospital believes that “time-restricted” feeding, as opposed to free choice, is preferable for most breeds and most owners. By time restricted feeding we refer to a meal being placed before them for a designated amount of time. When the time is up, the food bowl comes up. Most animals will catch on to this in the first couple of feedings. 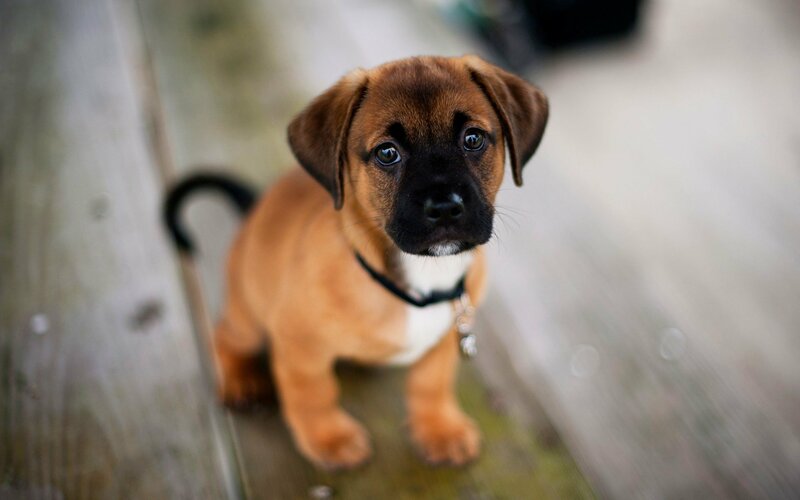 Ideally, puppies should be fed three times daily until four months of age. When puppies are young they have small energy reserves and need food more freqently than adults so they do not develop low sugar (hypoglycemia). Hypoglycemia can cause weakness, shakiness and even seizures in puppies. Once your puppy is six months of age you can decrease feedings to twice daily. As an adult dog feed once or twice daily depending on your pet’s preference. The other alternative is free choice feeding, which means leaving a bowl of food down at all times so the animal can eat whenever it wishes to. One drawback to this method is that it makes it more difficult to monitor food intake. With puppies it also makes house-breaking infinitely more difficult. Regardless of the feeding schedule chosen, it is very important to measure your dog’s food and give just that amount daily. Remember to take the calories from treats into account. This will help to prevent obesity in your dog. As a general rule, do not feed your dog around exercise time. This can lead to gastric bloat or a more serious condition called gastric dilation volvolus (GDV or twisted stomach). This problem is most commonly seen in deep-chested dogs (German Shephards, Great Danes, Golden Retrievers ….). GDV can be fatal even with surgical correction and prompt medical care. This condition can be fatal. To be on the safe side, do not feed your dog for an hour before or after excercising.